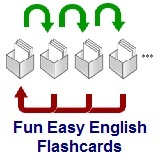 ﻿ Fun Easy English - new american english language vocabulary pictures words dictionary study practice flashcards presentation kids mathematics counting 1 10. This lesson has pictures of apples flashcards counting from 1-10 with descriptions in English. <iframe src="https://docs.google.com/presentation/embed?id=1mYMe2bqkMIoRbEu1p15KiRlxQM5CZmthwnOhoub2sgc&start=false&loop=false&delayms=3000" frameborder="0" width="480" height="389" allowfullscreen="true" mozallowfullscreen="true"